Quarry Ridge features approximately 63 acres of development land. Located along University Avenue/Highway 14 and backing up to the Pleasant View Golf Course in Middleton, this area features many options for development including: retail, office, industrial/flex and residential. 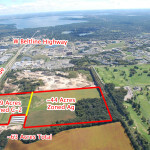 Approximately 19 acres fronting University Avenue are already zoned C-2 (Dane County). There are 76+ adjacent acres listed for sale by another owner and the two lots combined comprise nearly 140 acres of development land!